If I could have one hour of summer right now, to spend how I want, I would choose to sit on my front porch with a few people I love, and enjoy a beer. I really miss our porch during the winter months. I’m starting to ache a bit, just thinking about it. Having a house with a front porch has been a top priority of mine for years. One of the first essays I wrote—for myself, not for school—was about porches. This was more than 10 years ago, before I had children, when I spent many evenings walking my old neighborhood in St. Louis. The porch essay has in-depth theories about how front porches improve our lives and our communities. I talk about architectural styles and the importance of knowing your neighbors, and I reference how inventions like television and air conditioning changed the flavor of neighborhoods. I spout grand ideas about how ordinances should be passed requiring new houses to have front porches. Half joking, I even go as far as to suggest that people should be required to spend a certain amount of time of their porches. As a piece of writing, it’s overly romantic, much like my approach to life was then. But I can still get worked up about front porches. Watching the world pass by is what I love most. From the front porch, you don’t miss anything, and in our neighborhood, there’s plenty to not be missed. It must have something to do with living in a university town, where people have really irregular schedules and are always half-delirious from sleep deprivation. Even in the dead of winter, I see some of the strangest sights. The other night, Jason pointed out that a man was bouncing down the snowy sidewalk—in the dark mind you—on some sort of spring-loaded stilts. But summer is peak entertainment season, of course. Thinking about how much I miss porch-sitting, and how much I love our crazy neighborhood, I was inspired to go through my collection of Tweets to create a warm-weather sketch. Here’s what I found. June 16, 9:22 AM: Starting my work day. I can hear my elderly neighbor playing her flute, competing with the birds. June 19, 11:11 AM: took a walk. my hood & its people are achingly beautiful: toddler & mom making very slow progress down sidewalk; elderly man tending garden. June 25, 9:37 AM: neighborhood scene: guy riding bike down brick street while drinking coffee from a regular ceramic mug. July 13, 9:34 AM: on walk: heard a man making his baby giggle, smelled bacon & pancakes, saw an elderly asian woman adjusting the small US flags in her garden. July 17, 6:37 PM: neighborhood scene: elderly couple taking evening walk, wearing jaunty straw hats and holding hands. August 1, 1:34 PM: just saw a guy on a bike pulling a double-decker trailer contraption with 8 other bikes on it. I kid you not. August 17, 8:28 PM: just chatted w my neighbor on her porch while our kids played kickball. felt like summer evenings of my childhood, but now I’m the mom. August 20, 6:36 PM: porch sitting w J & wine. just saw an academic-looking older couple walk by, the woman wearing oven mitts & carrying some sort of cobbler. September 5, 5:45 PM: took a walk. saw: a man walking 3 dogs & smoking a pipe; fall squash ripening in gardens; a mom & toddler walking to meet dad @ bus stop. September 16, 1:43 PM: man across the street is taking his cat for a walk. on a leash. he does it all the time, and each time I find it humorous & sort of sweet. September 22, 7:23 PM: dusk is settling. the girls are outside w neighbors, puppies, clarinets, soccer balls and lots of energy. September 27, 3:31 PM: we just saw a guy walking down the sidewalk in our neighborhood wearing just a terry robe, w a towel over his shoulder & a toiletry bag!?!? September 30, 12:31 PM: someone just walked by the house w an iPod, singing at the top of her lungs. October 10, 2:24 PM: sounds & smell of a chain saw across the street take me to my grandparents’ cottage in NE Mich & the fall chore of stocking the wood pile. October 19, 10:35 PM: we were having so much fun porch sitting & talking after dinner w friends, that we didn’t get the kids home to bed until 9:30. bad parents. October 30, 5:58 PM: glad I went for the post-work walk rather than sofa-flop. gorgeous fall eve. saw several pumpkins being carved & made friends w a few cats. What do you see happening around you, when you slow down to a porch’s pace? Lovely little slices of life you’ve posted. I am always intrigued by the jobs here in Thailand that you would never see in the States now. The woman who rides down the street selling brooms from his cart; the man who sells ladders along the side of the road; the woman cooking noodles at a night market. These little snippets are what form our memories of a place. I have really enjoyed your blog since it was introduced with Chris’ blog project. This one in particular. I love, love, love front porches. The bigger, the better. We haven’t ever lived in a neighborhood that sounds like yours and I think I would love it. Along the same lines, it was important to us that we live in a neighborhood where we can walk to: a grocery store, a library, and a park. We pay the premium for such a location, and our rented condo is small, but we are very much in touch with where we live. My current neighborhood is a quiet one and the streets don’t see a lot of action. I used to live in a small apartment in the center of Brussels, Belgium, not far from the EU building. The best part of living there was getting to watch protesters fill the street. I loved all the marches downtown and the way Europeans zestfully participated in democracy. Love, love, love this post. We often forget the beautiful places we live in, many times thinking it’s greener on the other side of the pasture. It only takes a few minutes to stop and see the wonders right outside our front door, or porch as the case many be. This was a beautiful piece. It really made my day. The sense of “place” that I am searching for and have found at various points in my life, is a location that has a combination of still and moving features to it. A tree, a little bit of street traffic, some foot traffic is even better. The porch pace is the snow melting off a neighbors roof and the sound the melt water makes as it flows down to the street gutter. I love front porches, and you would enjoy my neighborhood! Most houses on our block have old-fashioned porches. Ours doesn’t – any more. A neighbor found a historic photo of our house (from the 1940s, we think) and it has a classic porch across the front. Some day, we’ll put it back. 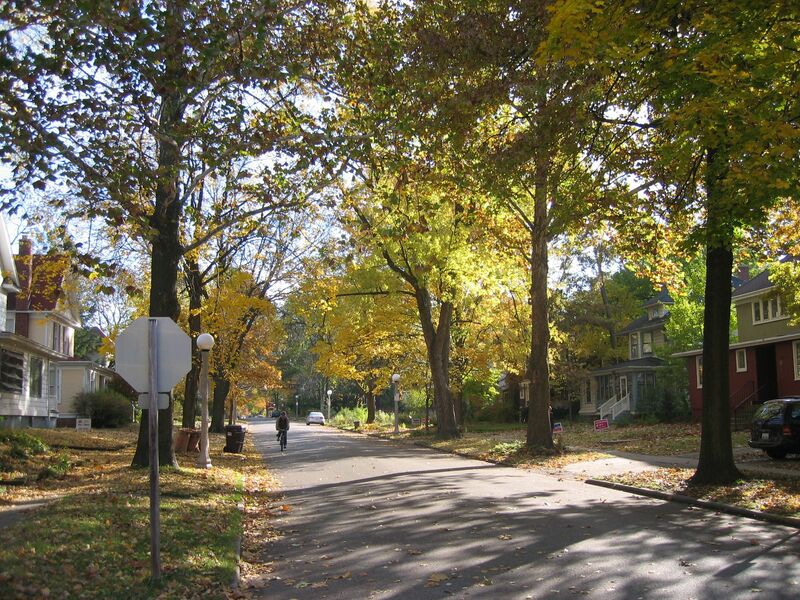 I live in a neighborhood that looks very similar to the one in the picture above. I’m a big believer in porches, too. I know a sociologist who wrote an entire dissertation on the disappearance of porches. Life changed for sure when we all started pulling into our garages. I once lived in a house for four years and saw my next door neighbors TWICE. Just one of the many reasons I returned to the urban frontier. I also love porches. I always wanted a farm house with a wrap around porch. I thought that would be so neat. Maybe, someday….. Loved your post about porches. I , too, love porches and would love to have a house with a wrap around porch, some rockers and hang with my friends and family. The only difference is we would be drinking margaritas!! LOL!! Great piece! Zoe, the slices of your own life in Thailand are so fascinating! Thank you for giving the rest of us a glimpse. Ari, I couldn’t agree more. This is the third house I’ve owned, and for all three, being able to walk to stores, etc. was my #1 priority. Many days, our second car doesn’t leave the driveway, because we can walk to the bank, library, food co-op, farmer’s market, post office, bakery, etc. Our 10 and 12 year-old girls have even started to go on little adventures together, like to the library for an hour. Such a wonderful freedom. V-Grrrl, as I said to Zoe, I love getting glimpses of life in other countries. It’s so colorful, and refreshingly different from what we see—not better, just different. Thanks for sharing your memories of Brussels. LisaNewton, you are so right about how often we overlook and fail to appreciate the beauty around us. And I often think the beauty depends on the scenery, and forget the people and moments that populate the surroundings, whether they’re stunning mountains or flat prairies. JR, I hope you’re writing your own porch post. :) It sounds like you have a great start. I love the way you described the sense of place you long for in your own life. Thanks for being open to inspiration, and for sharing with the rest of us. Rachel, yes, it is all good. As long as we’re aware, and taking it all in, right? I also think different people are drawn to different settings and scenes, which is only right and natural. Jenx67, the photo is of my street—our house is about halfway down the block. (Didn’t you say to Chuck that he found your soul mate when he picked my blog? Sounds like we live parallel lives!) But back to porches, I think attached garages, privacy fences and big back decks are evil! I know that sounds extreme, but when you think about what it’s done to our neighborhoods and interactions with others, I don’t think it’s too strong a statement.